featuring Sister Donald Corcoran, OSB Cam. Pope Francis has called for a new humanism, one grounded in the Christian understanding of human dignity and human potential. Pope John Paul II before him called for a renewed interest in sacred humanitas. What might this call mean, and how are we to respond? 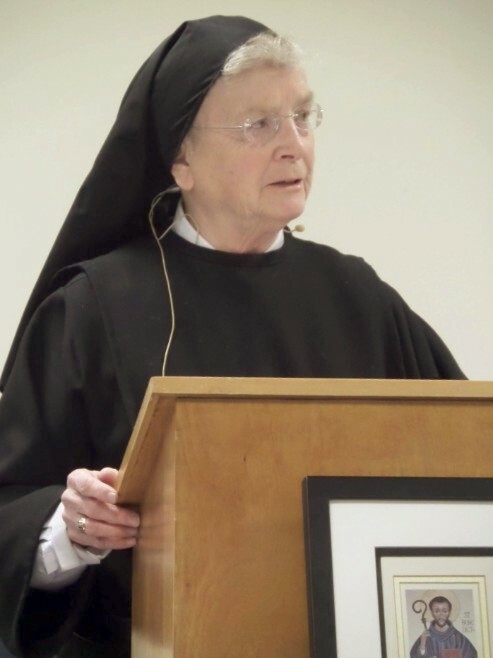 Sr. Donald, who recently gave a series of three lectures on this topic to the annual gathering of the American Benedictine Abbots, articulates her vision of sacred humanitas, grounded in the Benedictine wisdom tradition and drawing on the wisdom traditions of other faiths as well. - Keynote Address. Sister Donald Corcoran, author, scholar and Benedictine nun, says that in emphasizing a "largeness of heart that welcomes the stranger," Benedict offers a compass that can guide us through the fragmentation and discord of the present time. - Sister Donald Corcoran explores the ways that an expanded concept of Sacred Humanitas might change the ways we see the world and interact with one another. - Dr. Kathleen Henderson Staudt pursues the scope of a new theology built on a renewed humanism.